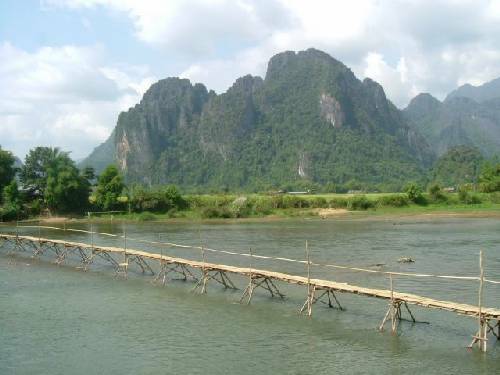 Karina: We love Laos .... 'Same Same Only Different' - this is a commonly used phrase out here. Today we had a wonderful drive (over 7 hrs including a couple of stops) with our delightful driver Thong (not to be confused with Phong, our guide in Hanoi or Dong - the Vietnamese currency). We drove through lovely mountain scenery and numerous villages of the Mhong hill people. Such lovely hard working people living in difficult conditions is quite humbling. Would not want to do that route in the rainy season. We saw lots of deforestation which may be the cause of terrible landslides which often wash houses down the mountain side. As it was we saw 3 lorries that had come off the road - one with a cargo of beer that was scattered down the hillside. We have arrived in the gorgeous town of Luang Prabang (actually Laos' 2nd largest city but laid back & relaxing). Quite colonial & touristy but in a rather gentile way, lots of French influence. I thought I would have a quick snooze when we arrived. Just got my head down when it sounded like a band was coming up the street. We rushed outside to see what was going on & it was the novice monks who are in a temple right next door banging on a huge drum about 2o metres from our room! They drummed for about 15 mins & it was wonderfully atmospheric - apparently for the full moon tonight. The town is tucked between 2 rivers & the main part can be walked around in an hour or so, We've just had a mooch round the interesting hill tribes night market (bought some throws for the lodge!). LP is quite different from Vang Vieng where we stayed last night. We had beautiful mountain & river views from our hotel but it was a bit of a young back packers party town. However we have finally settled down into a much more relaxed pace after a couple of pretty intensive weeks. This morning I got up early to watch the sun rise over the mountains, alone apart from a couple of competing cockerals & a few locals on the way to work .... that is until a party of Koreans invaded my peace! Last night I had a traditional Laos massage - talk about bone crunching - I felt like I had been run over by a train ... but I am sure it was good for me! Afterwards I decided to splurge out the $2.50 for a pedicure. My masseur popped my feet in a bowl of hot water & then disappeared on her bike! A few minutes later she was back with a young girl who was to do my pedicure. Through a bit of broken English & sign language I found out that this girl was only 13, Vitnamese (I couldn't work out why she was in Laos), had no parents & didn't attend school. I felt in a real moral dilemma - not wanting to exploit her child but to get up & leave would have upset and offended her. I continued & she did a great job. I let her choose the colour (a bright pink!) & gave her a little gift but the whole thing shocked & upset me. Without education she will likely never break out of the cycle of poverty. At least with her skill as a beautician this child may be able to avoid slipping into prostitution. There are many bizarre contrasts we see in this beautiful country. The people are absolutely charming yet they suffered 3 million bombs dropped on them during the Vitnam war (one bomb for every person we have been told). There are massive areas of the country that are full of unexploded ordnance & therefore so many injuries sustained through them. Most people are incredibly poor, yet many of the simplest homes have satellite, we have seen several local people with ipads & there are a massive number of pretty new cars from Chinam Japan & Korea. Tomorrow a day with a guide to explore more. Well played Macc last night!